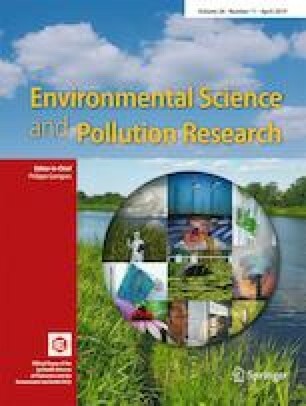 To investigate and assess heavy metal contamination on the farmland soils of a typical mining city, the concentrations of Cu, Cd, Zn, Pb, As, and Cr were analyzed from four mining areas (Tongguan District (TGD), Shunan Town (SAT), Tianmen Town (TMT), and Zhongmin Town (ZMT)) and two control areas (Xilian Township (XLT), Donglian Township (DLT)) in Tongling City, China. The total metal concentrations in the soils were in the following order: Cd ˂ As ≤ Pb ˂ Cu ˂ Cr ≤ Zn. Total metal concentrations in the soils of mining areas were significantly higher than those of the control areas (P < 0.05). According to the Chinese Environmental Quality Standard for Soils (GB 15618-1995) and geo-accumulation index (Igeo), Cd and As pollution in the farmland soils of the mining areas was the most severe, followed by Cu. The Igeo values of soil heavy metals of TGD and SAT were the most highest, followed by those of TMT and ZMT. The health risk quotient (HQ) of heavy metals in the soils showed as follows: HQAs ˃ HQPb ˃ HQCr ˃ HQCd ˃ HQCu ˃ HQZn, and the total average daily exposed dose (non-carcinogenic risk) of As was the highest except that of Cd. The contribution rate of carcinogenic risk index (CR) to total carcinogenic risk index (TCR) of As and Cd in the topsoil for adults was 99.91% and 0.09% respectively, and the value for children was 99.87% and 0.13%. The CR and TCR of As in the farmland of mining areas were greater than 10−4, which showed the carcinogenic risk is an intolerable range for both adults and children. According to the results of the present study, it can help the local people know the pollution of heavy metals in farmland and adopt the best suitable agriculture practices. This work was supported by the Key Research and Development Project of Anhui Province, China (No.1804a07020121), the Natural Science Foundation of Anhui Province, China (No. 1808085MC80), and the Special Foundation for Young Scientists of Anhui Province, China (No. gxyqZD2016236).